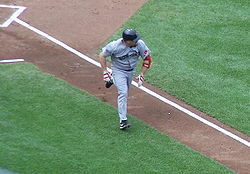 ^ "Youkilis' streak falls 1 game shy of record; Ties minors mark with 71 games on base". The Cincinnati Enquirer. August 7, 2003. Archived from the original on July 20, 2012. Retrieved June 4, 2007. 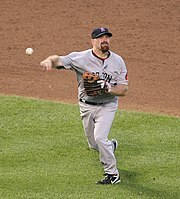 ^ "Boston's Kevin Youkilis wins American League Pepsi Rookie of the Month" (Press release). MLB.com. June 2, 2004. Archived from the original on March 19, 2008. Retrieved March 19, 2010. 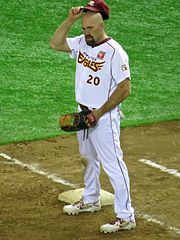 ^ "Kevin Youkilis". 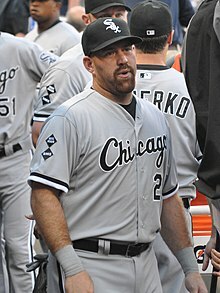 Baseball Reference. Archived from the original on July 18, 2012. Retrieved June 5, 2009. 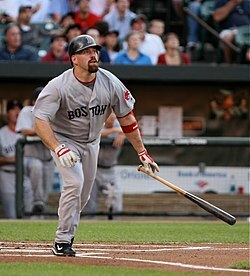 This page is based on the Wikipedia article Kevin Youkilis; it is used under the Creative Commons Attribution-ShareAlike 3.0 Unported License (CC-BY-SA). You may redistribute it, verbatim or modified, providing that you comply with the terms of the CC-BY-SA.